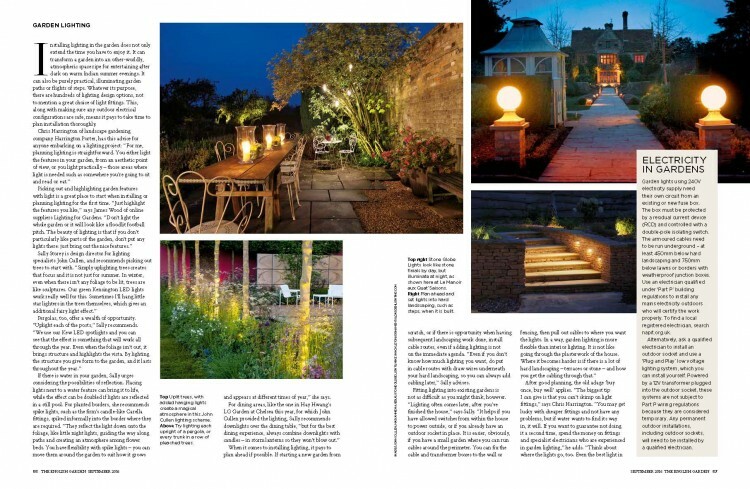 Design Director Sally Storey talks to English Garden Magazine to tell you her guide to great garden lighting. See how introducing light to the garden can completely transform it after dark, creating an enchanting atmosphere once the sun has gone down. 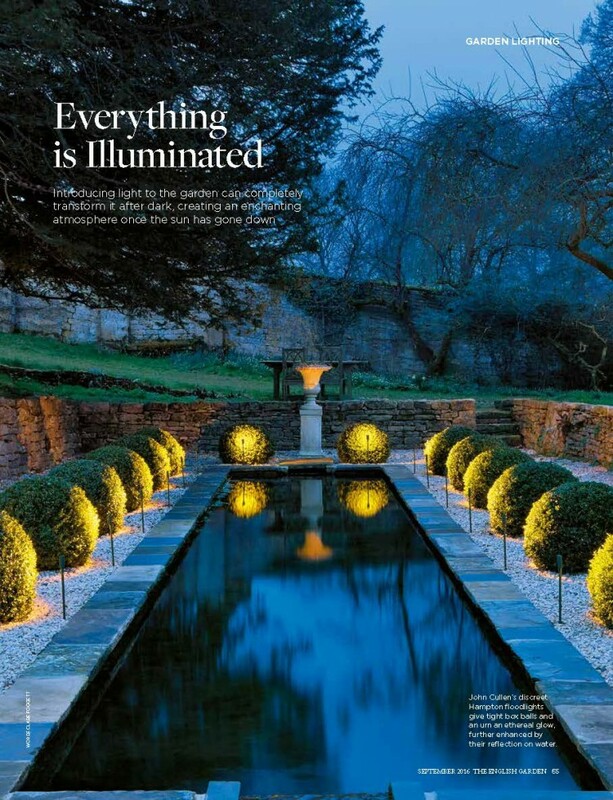 With tips from our Design Director Sally Storey along with renowned landscape designers, this feature will give you excellent garden lighting ideas to extend the time you enjoy your garden. It also covers a section on using electricity in garden so you can familiarise yourselves with requirements. Sally says “By lighting your garden, you have an outside room. Visually, from inside the house, you achieve that ‘inside-outside’ feel as the night draws in. Whether you are outside using it or not doesn’t matter – you still have that visual extension. “If there is water in your garden,” Sally urges “consider the possibilities of reflection. Placing lights next to a water feature can bring it to life, while the effect can be doubled if lights are reflected in a still pool. For planted borders, she recommends spike lights, such as the firm’s candle-like Carella fittings, spiked informally into the border where they are required. “They reflect the light down onto the foliage, like little night lights, guiding the way along paths and creating an atmosphere among flower beds. You have flexibility with spike lights – you can move them around the garden to suit how it grows scratch, or if there is opportunity when having subsequent landscaping work done, install cable routes, even if adding lighting is not on the immediate agenda. “Even if you don’t know how much lighting you want, do put in cable routes with draw wires underneath your hard landscaping, so you can always add cabling later,” Sally advises.